Now Document Backup can handle files that are open by other applications. Even if your files are locked by the operating system and can't be read by a regular backup utility, Document Backup will be able to read and back them up through the VSS subsystem, available in XP and above. Read more on Backing up open/locked files. Encrypting your backup copy will keep it safe and unavailable to an unwanted eye. Nobody but you or persons you authorize will be able to access the backup data. Thanks to the built-in scheduler, you can stop worrying about the safety of your data. 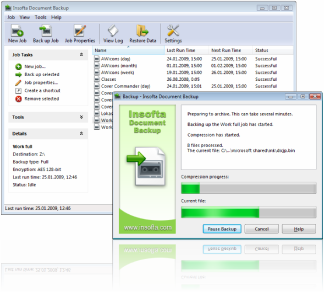 Document Backup makes backups of your data in a fully automatic mode. Backing up to local and network HDD. Backing up to CD, DVD, Blu-Ray or HD-DVD.